When I attempt to modify route P Elsfont - Cabbourne on the Bridgewater-Brunel server, the server crashes and the client disconnects and keeps running. It is very odd that this should crash only the server. I have not been able to reproduce this in single player mode (on the assumption that any modification whatsoever is sufficient; if this is not so, I will need to know the specifics of the modification necessary to reproduce this reliably). I removed all stops before Corn Barngrave and rerouted the line to Embury. No matter what stop I click in the schedule (even stops that are well within its actual range), this happens. If I send it to depot, which also are within range, provokes the same result. That's basically what happens to the client. In my case the server crashed. Thank you for the reports. I am still not entirely sure what is causing the crash, but I have fixed a calculation issue and possible integer overflow issue, which should hopefully help. I should be grateful if anyone could let me know whether this issue is abated or resolved in the next nightly build. 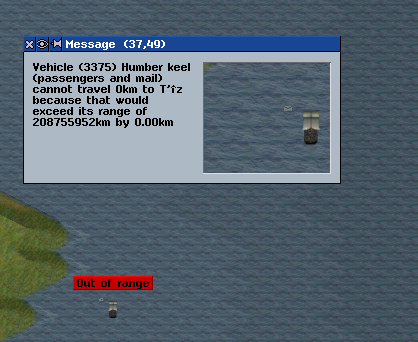 The vehicles completely spam the message board with out of range messages! Crashed again! On the same line I first removed Elsfont Parish Hall Stop, then closed the line schedule window, then shortly afterwards removed Wake Yendgate Corner Railway Station. The server crashed and the client kept running with convoys spamming out of range errors. I think that I have now fixed this - I should be grateful if you could re-test with to-morrow's nightly build. I have also made a modification which might fix the crashes, but, since I am not able to recreate them locally, I have not had a chance to test this. I think I can reproduce these crashes, and have part diagnosed the problem (before getting stuck on *why* something is happening). First, the reproduction: I can consistently crash the game by creating two passenger docks (a long way apart), a shipyard next to the first dock, and then scheduling a skiff wherry to run from the first dock to the second dock (and back). The crash occurs when the wherry tries to route from the first dock to the second, discovers it is too far, and attempts to generate a message. $45 = 0x555560fd5700 "land stop 2 dock"
1. The first %s is formatted correctly. 2. The following %i is formatted using the fourth argument instead of the third. In particular, 1627215616 is the value of the least significant 32 bits of the pointer 0x555560fd5700 as a uint32. 3. A segfault occurs while trying to format the following %s. Give the above, it seems likely that it is trying to read one of the remaining arguments (either the integer or the double (previously a float)) as a string, resulting in a buffer overflow. Incidentally, note that the "sengers)." at the end of buf is what was previously on the stack (I checked beforehand), and appears because the segfault occurred while buf was being written to (so before the terminating null was replaced). So, that is what is happening. The question is: why? Wrong format specifier - distance is a double trying to be printed with a %i. Thank you both very much for that: I have now fixed the incorrect format specifiers. I have now fixed the incorrect format specifiers. I disagree. I think you mean "%.2f", not "%f.2". Having read the linked page, I think what was happening is that the int and pointer arguments are stored in one place, and the floats in another. Then when parsing the format string, it took the first int/pointer as a pointer, the second int/pointer as an int and then the third int/pointer as a pointer, when this data passed in was in fact a pointer (correct), a pointer (wrong, but no crash) and an int (segfault on dereferencing the non-pointer). Thank you - syntax error now corrected. The change in line 981 of player/simplay.cc now reads "%.f2fkm", which is different from both line 988 and ACarlotti's advice. I have no idea what is right but it looks like it might possibly be a typo. Thank you for spotting that: now fixed.